Note: video contains crude, profane language, but the story about a black woman on welfare can best be told by a working black woman who understands that when you have 15 children by three different men (12 of whom are now living with her), and who is demanding that whomever is responsible for her lot in life to stand up and take responsibility for her illegitimate children. What decided me to post a video containing foul language? Because this video shows that not all minority members of society are deadbeats. And, conversely, by circumstance, it tells us that not all deadbeats are minorities. There are as many lazy white deadbeats in America as there are black Angel Adamses who thinks America owes them a free living because they never asked to be born. Adams, in the video of her rant spliced into the Lovelyti.com video, tells the audience, "I don;t have any clothes. People been donating food to me...just helping me out with food. I don't have anything." Tampa Channel 8 News talked to Hillsboro Dept. of Children & Families who told them that Hillsboro Kids, Inc. have been paying her rent and utilities and they also provided the furniture in her apartment. Adams told Channel 8 that whatever they're doing for her isn't enough. "Somebody," she said, "needs to pay for all my children and for all the stuff I need...Somebody needs to be held accountable. And they need to pay." On one version of the video about Adams, a woman named Catherine DeLancret commented on Adams' statement that someone needs to pay. "Uh," DeLancret fired back, "that would be you, sweetheart. Don't breed what you can't feed." In most States, the Departments of Welfare pays by the head. The State of Florida pays approximately $245.00 per child per month. What that means is each additional baby is worth money. With 15 children, Angel Adams (the deadbeat mom depicted in this video) would have been eligible for temporary monthly assistance for the children totaling $3,675.00. Any welfare sum allocated for Adams' personal needs would be based on whatever income she earned prior to becoming unemployed, and/or what she was doing to join or rejoin the work force. In Adams' case, we assume the amount allocated for her (excluding the allocation for her children) would have been "zero." (As noted, when she was lodged in the motel depicted in the video, Adams only had 12 of her 15 children with her. Why, after the Republican Revolution of 1994 when the GOP forced Bill and Hillary Clinton to keep their 1992 campaign promise to "end welfare as we know it," and why after 14 years of converting welfare to workfare, did the federal government opt to reignite culture of dependency on the federal government? Because the Democrats needed to reinstate the welfare entitlements of the 60s, 70s, and 80s in order to take back both Houses of Congress in 2006. (Even then, to get the votes, the left had to resort to expanded early voting although the Constitution of the United States [Article II, Section 1, paragraph 4] designates that the votes for the President of the United States will all be cast on one day.) The date can be changed by the States, but to change "Election Day" to a multiplicity of days requires a Constitutional amendment since the Constitution mandates the voting will take place, nationwide, on one day. Doesn't it seem strange to you that long before we had cars, buses, trains and planes, this primitive nation could vote for, and elect, a national leader in one day? No early voting. No absentee ballots. Early voting and absentee ballots were created for one purpose and one purpose only—to promote vote fraud. There are 85 million registered Democrats in the United States but there are only 36 million self-described social progressives. To promulgate the communist agenda the socialists required to erase liberty and create a socialist society in America, it was first necessary to expand the length of time for people who did not have the right to vote, or imaginary people who don't exist to vote, could nevertheless vote under a shroud of secrecy—not just once, but several times in order to overwhelm the electorate and create a communist gulog in America. Since 2009 when Barack Obama arrived in Washington with his "gotcha" bag of gifts and tricks, the number of people receiving food stamps and other gratuities from the State has skyrocketed until now, over 67 million American families—or 1 in every 7 Americans—are on food stamps or some other form of government assistance. Remember the Tupperware parties of a few years ago? Or Sarah Coventry? Avon? Mary Kay Cosmetics? Or Amway? How about today's newest fad—USDA SNAP parties (Supplemental Nutrition Assistance Program). 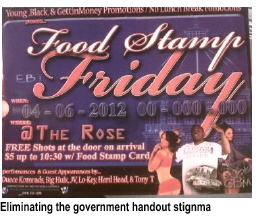 In layman's terms, Food Stamp parties. The Obama Administration has been soliciting recipients for food stamps ever since the community organizer found his way into the Oval Office. And you wondered why 67 million American families joined the "Gimme Stuff" crowd by allowing themselves to get addicted to food stamps? Because the USDA made it easy. They made it "okay." And, they made it fun. But what Uncle Sam can't do is make selling your pride for a stipend from the State palatable. If your family ethics is centered on working for what you have, then the gratuities of the State that shackle you to Big Brother's feeding trough is more than a discomforting embarrassment. It makes you feel like an indentured servant of the State. But that's only because you have become just that for taking Obama's government gratuities. On election day you discover the reality that the chain which shackles you to the feeding trough also chains you to the bureaucracy's voting booth and, too late, you discover the price you paid for the gratuities of the government is their control over how you vote. The "free stuff" had a price tag all along. Sadly, the price tag was liberty. Beware of people bearing free gifts. When Barack Obama leaves the Oval Office, liberty and freedom will leave with him. So, you can sign up for the free-stuff or take back your country.